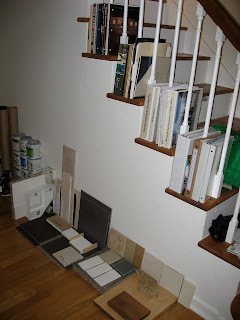 Along the floor, from left: tubes of house plans, nine paint sample quarts, three door samples, about 25 tile samples, sample door/window trim pieces, granite and solid surface countertop samples, a maple flooring sample, and a cabinet wood sample. There's also another (smaller) exterior design department in the garage. I really, really hope we're getting close to the end of the road on choosing stuff.